Cooking at high temperatures can damage oils. 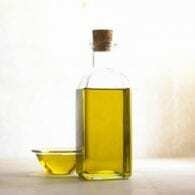 The more omega 3 fatty acids in the oil, the less suitable it is for cooking. The heat not only damages the fatty acids, it can also change them into harmful substances. Hydrogenated oils are often used for cooking. Because these oil have already been “damaged” by chemical processing, they are less likely to be further damaged by heat. The oils that are higher in saturated fats or monounsaturates are the most stable when heated. These include peanut oil and olive oil. The more fragile oils are best used at room temperature, like salad dressings. To preserve the nutritious properties and the flavor of unrefined oils, try the “wet-sauté,” a technique that is practiced by gourmet chefs. Pour around one-fourth of a cup of water in the stirfry pan and heat just below boiling. Then add the food and cook it a bit before adding the oil. Wet-sauté shortens the time an oil is in contact with a hot pan. Stir frequently to further reduce the time the oil is in contact with the hot metal. Never heat oils to the smoking point, as this not only damages their fatty acid content, but also their taste. Best cooking oils and fats are: butter, peanut oil, high oleic sunflower oil, high oleic safflower oil, sesame oil, and olive oil. Whenever possible, eat the food, such as fish or seeds, rather than the extracted oil. These foods contain other vital nutrients in addition to the energy-producing fats and healthy fatty acids. If you are buying oil in large quantities, it should be stored in dark bottles. Clear glass or plastic bottles allow light to penetrate the oil and oxidize the fatty acids in a chemical process similar to metal rusting. If the oil comes in a clear bottle, wrap it with a dark covering. Keep the lid on tightly between uses, as contact with air will affect the quality of the oil. Purchase in small quantities, and use within a month or two. The healthier the oil, the more quickly it spoils. Store oils in a cool, dark place. Unrefined oils spoil more easily when exposed to warm temperatures, so they need to be refrigerated if you are not going to use them right away. An exception to this is olive oil, which need not be refrigerated. It is high in oleic acid and contains antioxidants which slow spoiling. Other cooking oils, such as safflower, sunflower, and corn, are high in linolenic acid and are quick to spoil. It’s definitely worthwhile to pay extra for organic oils. Many oils come from plants that are sprayed with pesticides, which are usually fat-soluble, and thus concentrate in the oil portion of the plant. One of the safest oils is extra virgin oil, which is not refined or deodorized, and may even be organically grown.